I was looking forward to today with some excitement. The thought of walking over the border from one country to another signified how far I had come since setting off some thirty days ago from Le Puy en Velay. Other walkers and pilgrims shared the excitement. For some it was their first day of a four week pilgrimage. 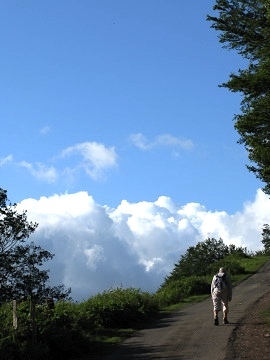 For others it was an important stage of their walk from Le Puy or from other starting points. Saint Jean Pied de Port is not a very large village and it was not long before the climb started. There had been a shower of rain and rain still threatened. The sun shone through to produce wonderful rainbows against the hillside backdrop. We had been warned it would be a difficult stage. Soon the climb steepened and the wind became stronger. The Way seemed to climb forever and everyone plodded on fighting against the strong gusts. There was no let up in the climb. 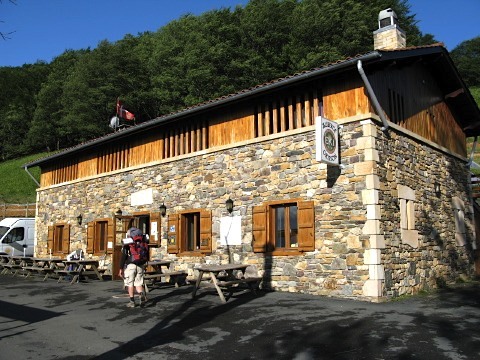 It was an eight kilometre walk to the refuge-auberge at Orisson. Even after this short distance everyone was tired and windswept and glad for a rest and a coffee. There, sitting outside, was Kaas from the Netherlands. I had last seen Kaas at Miramont Sensacq where he had sung a Russian carol after dinner. It was good to see him again. He had a wry smile on his face that somehow told me that he knew what was ahead. I also chatted to John from Toronto in Canada. It was his first day and he was taken a bit by surprise by the strong wind and steep climb. He was already exhausted from the battering wind. I heard from the owner of the auberge that the wind had already blown someone off their feet. The lady walker from Brittany had suffered a broken shoulder as a result of the fall. Pascal later told me it was he and Bernard who had back-tracked a kilometre or more to raise the alarm. The Way continued upwards into the sky and clouds before opening up into a wide alpine plateau with the mountain pass ahead. There was a small Japanese girl with a huge rucksack struggling against the wind. I marvelled at how she was making such good progress. She had a scarf tied round her head and was wearing what looked like light gym shoes. She battled on. It was three steps forward and two back as another gust of wind blew us all backwards. The scenery was stupendous with the visibility being so good. I had heard stories that when the weather was really bad, it was best to take the valley via Valcarlos and to follow the main road along it to Spain. I was glad that I had the views but did consider for a moment that the valley route would have been much easier. The shadows of the clouds darted across a hill side opposite. Seventeen kilometres after leaving Saint Jean the climb ended. Finally I reached the Fountain of Roland and filled up with fresh water. 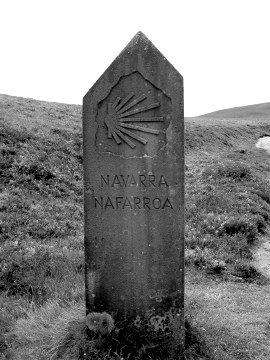 Shortly after was a huge stone pillar announcing Navarra. It was only a short time later that I realised that this was the border marker with Spain. There was some woodland after the border and as a result some good shelter from the wind. I felt elated that I had made it to Spain. I thought ahead to the next few days. Realising that I was low on some supplies, I made a mental note. The gas was getting low for the gas cooker, I had run out of contact lens solution, and I needed some more soap to hand wash my clothes. I wondered how hot it would be in Spain, and thought that maybe it would be a good idea to buy a lighter pair of shoes for walking in the heat. Not long after at the Col de Bentarte (1330m) the wind started again as I left the shelter of the woods. It was a good time to stop for lunch. There was a small hut and I entered. A couple I had met the night before were there as was a Spanish man. Though I could chat to the British couple, I realised that I could not converse with the Spaniard as he spoke no English and I spoke no Spanish. 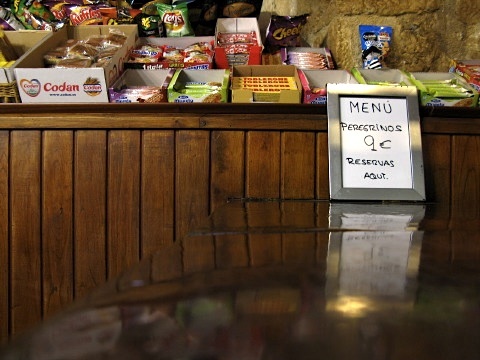 Would it be like this is Spain? I had to make an effort to learn some Spanish. 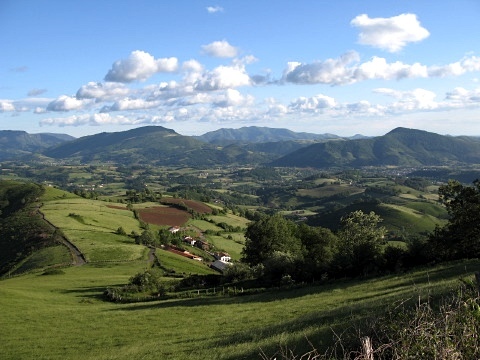 They all left shortly after as they had been there a while and were keen to press on to Roncesvalles. On my own in the hut I noticed a tube of something an the bench top. It was a tube of German clothes washing cream. One item from my list had been struck off. After the highest point a few kilometres later at the Col Lepoeder (1440m), and sighting Roncesvalles far below, the Way descended through peaceful rich woodland. It was such a relief after being torn by the wind on the exposed peaks. I thoroughly enjoyed the walk through the woods and it was all downhill too. I was quiet and relaxed. I took many photographs and took my time. I seemed to be in the woodlands forever. 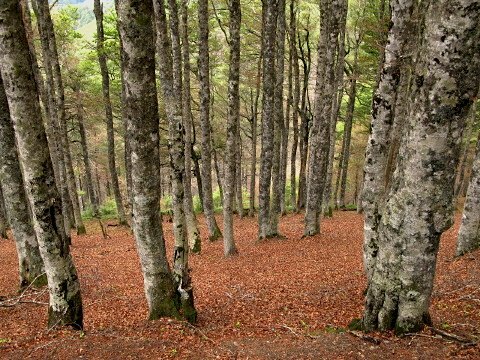 The descent came to an end and suddenly the woods opened up – I had arrived in Roncesvalles. I found the 12th century Augustinian monastery with it’s Pilgrim welcome and paid my €6 for a bed for the night. 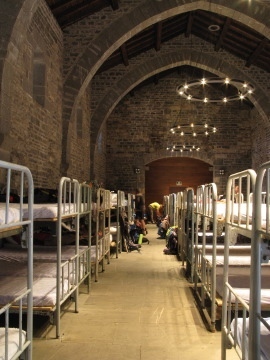 The dormitory was huge with 110 beds! After France it was quite an eye-opener and a little disconcerting. I laid out my sleeping bag and took a shower ready for the Pilgrims meal of soup, fresh trout and yoghurt later in the evening at one of the two restaurants. I had met up with Deirdre, a friend of hers called Filippe, and Takumi who I had last met in Aire sur l’Adour and we all dined together. Someone said that the wind on the mountain that day had reached speeds of 120km/hr. We were all tired and relieved that this difficult day was finally over. Returning to the dormitory I descended to the shower and communal area below. There was an area where pilgrims ending their walk at Roncesvalles could leave items surplus to their needs. New pilgrims were welcome to take what they needed for the Way ahead. Side by side was a gas canister (the same make as my gas stove), a new bottle of contact lens solution, and a pair of light shoes that fitted me perfectly. When I recounted my story to others later some were not surprised saying that ‘the Way always provides’. Perhaps the Way was making its presence felt. 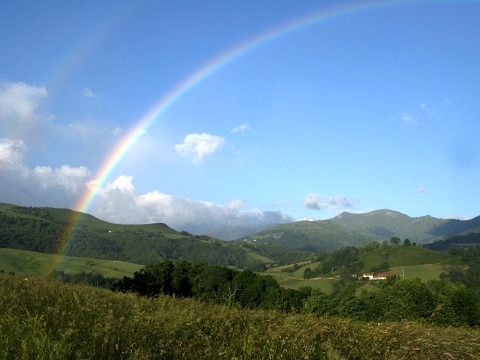 This entry was posted in From the Way and tagged Roncesvalles, Saint Jean Pied de Port, Way of Saint James, Week Five. Bookmark the permalink. Post a comment or leave a trackback: Trackback URL.